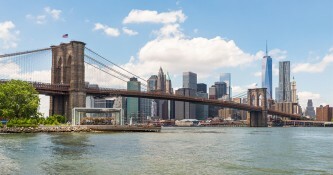 New York City day tours and helicopter tours of New York Combo package. 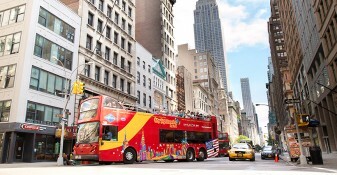 48-hour double decker bus tour with unlimited hop-on hop-off access in Downtown, Uptown and Brooklyn PLUS Liberty Helicopter Big Apple tour! 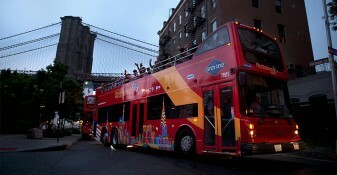 Also includes: FREE Night Tour, Hop-on Hop-off Sightseeing Ferry and Eat and Play discount card with extra savings! 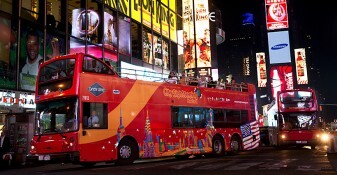 See the Big Apple like never before with this all-encompassing tour! Your sightseeing package includes 5 unique bus loops through Manhattan and Brooklyn, a 90-minute ferry cruise and a thrilling helicopter tour featuring breathtaking aerial views of Manhattan’s top attractions. Few can say they’ve soared over Central Park, Ellis Island, or One World Trade Center. You’ll see NYC from a perspective that most locals have yet to experience on the Big Apple helicopter tour! And your comfort and safety are the top priority at Liberty Helicopter, so you’ll fly with peace of mind. This tour is voted number by by Liberty Helicopter customers! 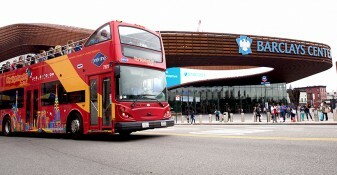 On your 48-hour bus tour, you’ll learn about the fascinating history and culture of NYC on fully-narrated tour loops through Uptown, Downtown and Brooklyn. Customize your trip with ease by taking advantage of unlimited hop-on hop-off access at 40+ stops. 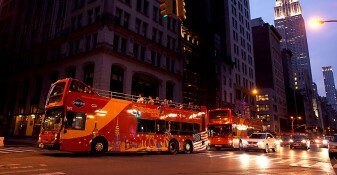 Experience the bright lights of Times Square or take a relaxing stroll through Central Park. 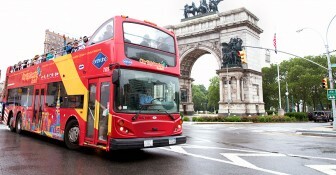 Just hop off the bus at one of many stops throughout the city and discover world-famous landmarks at your leisure. 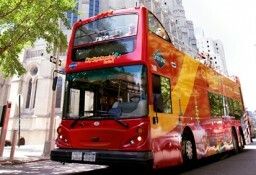 Buses run every 25-30 minutes – simply hop back on the next bus to continue your tour! 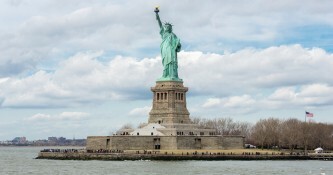 • Helicopter tour with bird’s eye views of the Statue of Liberty, Ellis Island, and more! 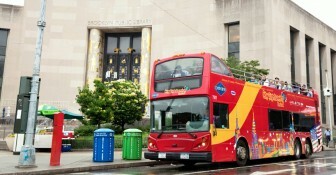 All Around Town Buses: Tour lengths vary based on route and can range between 90 minutes and 3 hours. 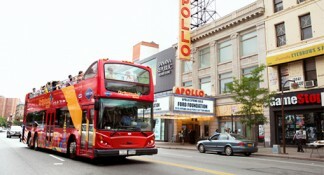 All Around Town Bus Tours: Times vary by tour loop. Buses run continuously every 20-30 minutes. Do I need to make a reservation for my Big Apple Tour? Yes, Liberty Helicopter Tours requires reservations. To reserve your tour, please call their reservations department at 1-800-542-9933. Your voucher is valid for 6 months. After redeeming your voucher, you have 48 consecutive hours to use your All Around Town bus pass and included extras. Your helicopter tour date and time must be coordinated with Liberty Helicopter Tours. What attractions will I see on my helicopter tour? You’ll see a lot! Some highlights include the Statue of Liberty, Ellis Island, Governor’s Island, the Financial District, One World Trade Center, Empire State Building, Chrysler Building, Met Life Building, USS Intrepid, George Washington Bridge, Woolworth Building and Central Park. You have 48 hours to explore 5 bus routes. Bus routes range from 90 minutes to 3 hours in length. Your helicopter tour lasts approximately 15 minutes. Do I need to specify a date of travel when I place my order? No. When you start your order, you will have to choose the day you believe you are going to use the voucher. However, we understand that plans change, so you’ll have 6 months to make your use your voucher. Once you’ve made your reservation with Liberty Helicopter Tours, your helicopter tour time is confirmed. Cancellations made more than 24 hours in advance will be subject to a $40.00 per person fee. Cancellations made within 24 hours of reservation will be subject to full price cancellation fee. Is narration available in my language? Most likely! In addition to the live commentary in English, our bus tours offer recorded narration in English, Spanish, French, German, Italian, Hebrew, Portuguese, Mandarin Chinese, Korean and Russian. Why am I charged a heliport fee? 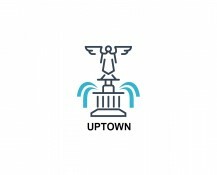 This fee is required by the Downtown Manhattan Heliport. Every helicopter company is mandated to charge this fee. For your safety, tours may be cancelled due to bad weather. If you have any weather concerns, please contact Liberty Helicopter Tours. If your tour is cancelled due to inclement weather, Liberty Helicopter Tours will work with you to schedule a new date and time. You may bring your camera or recording device on board to capture the experience! All other personal belongings (including purses, scarves, backpacks, hats and all loose items) must be put in a secure locker (provided) prior to boarding.